The sketch from Cardabilities was my jumping off point for this design. After die-cutting the rectangle from designer paper, I added the circular designs with a Copic Multiliner and a round die. Thought it would be fun to add three types of circles! Next comes some stamped splotches in turquoise. 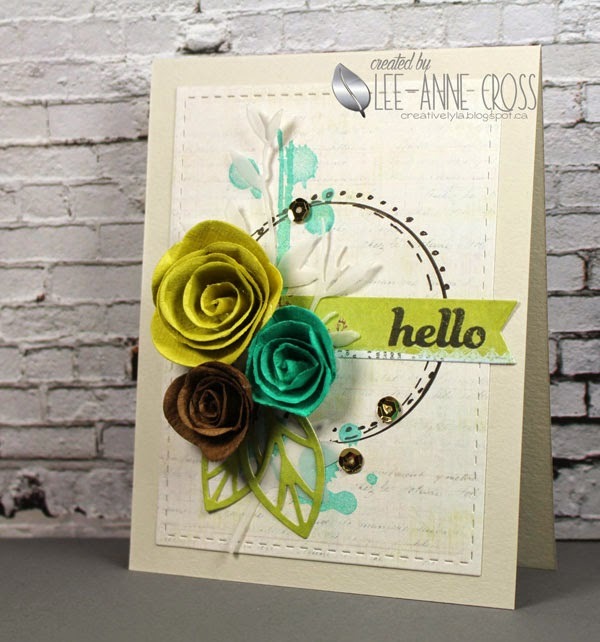 A die-cut vellum stem, some die cut leaves, some Prima flowers, followed by more die-cut designer paper for the stamped sentiment. And finally, a smattering of sequins. It’s always fun to step outside your comfort zone and just simply try different things. 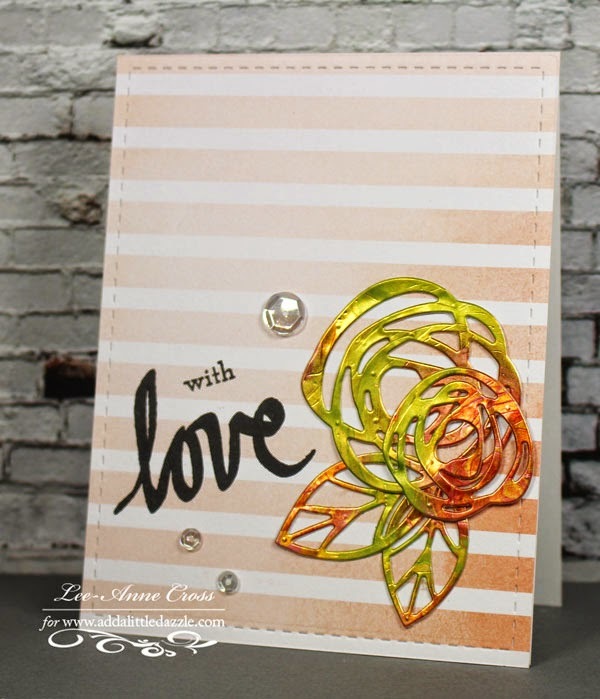 All good things must eventually come to an end and after much consideration Monica Weaver from Add a Little Dazzle has decided to close the Dazzling Diva Challenge. 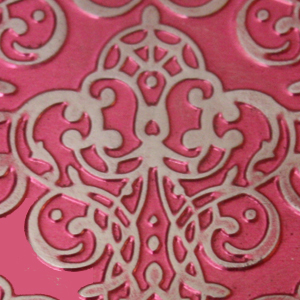 The blog and boutique will continue being open offering unique creations and Add a Little Dazzle Craft Metal Sheets. I invite you to continue following the Add a Little Dazzle blog. Many years ago, I walked into our great room and look out the window into our backyard. Two of our large ornamental crabapple trees were covered in Monarch butterflies. You could hardly make out the trees for the Monarchs! It was an amazing sight, and one that I shall cherish forever. Sadly, my camera was out of commission at the time and I have no pictures to share…but I retain that amazing scene in my memory. 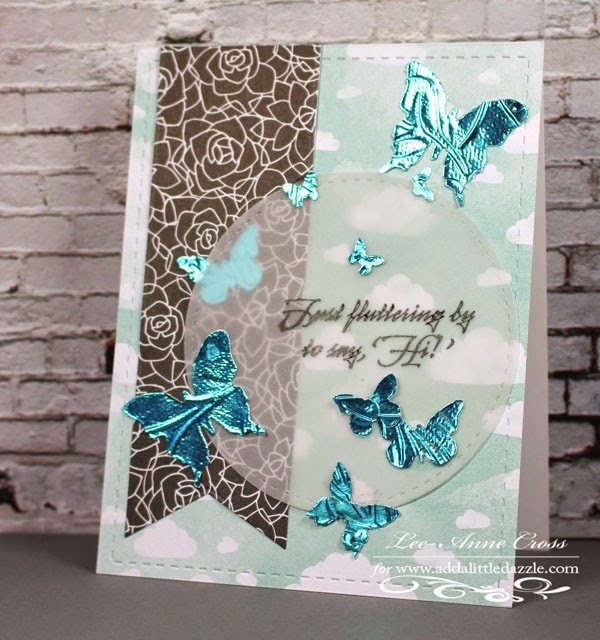 A simple design with a whole lot of butterflies 🙂 I’ve die cut the butterflies with my Tim Holtz Butterfly Frenzy die and then placed them in an embossing folder. Instead of running them through my Big Shot Pro, I’ve just used a brayer to emboss them…works like a charm! I recently got this fabulous new stencil from ARTplorations and couldn’t wait to ink it up! The stencil has been inked with three shades of Distress Inks and misted with water before placing it on some watercolor paper. 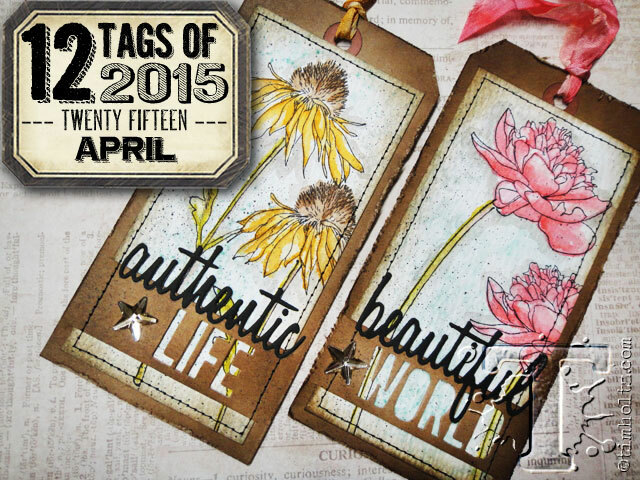 I’ve inked a matching butterfly stamp with the same three inks, misted it and stamped the tag with it. Next comes a bit of spritzing with a marker and finally a few sequins. I’ve used the Persian Motifs from Altenew, as I don’t have his new floral stamps. And basically followed his instructions, using my own mix of colors. He’s showcasing the Distress Markers with his techniques this month, and that’s exactly what I used. And, as I didn’t have his dies, again, used what I had. Rather than use my sewing machine, I’ve done faux stitching around the tag. This was fun and I really loved using my markers for his techniques! I’m back with another Dazzling Diva Challenge. Will you look at this lovely mood board? Yes, there’s a lovely metal rose on my card 🙂 Just lots of die cuts,a little stamping and some inking on this one. I ended up using a piece of Golden Glimmer and marbling it with Inka Gold and PITT Artist Pen Big Brushes. You still get the gold coming through, but the marbled effect gives you yet one more option for working with the metals. The rest of the Divas and I would love to have you join our Dazzling Diva Challenge! 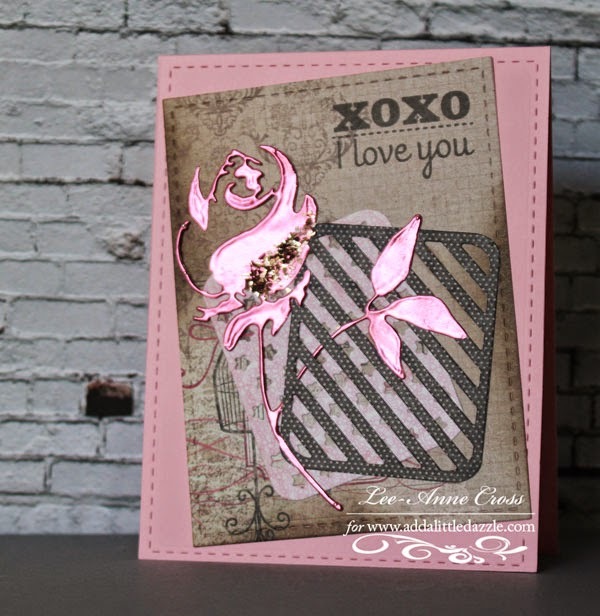 Use of AALD craft metal sheets is not a requirement to play along, but we’d love to see you use them! There is a $15 gift certificate up for grabs. If you use AALD craft metal you’ll receive an additional $5 in merchandise…BONUS!